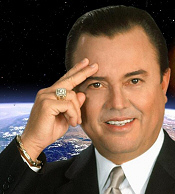 Jose Luis De Jesus Miranda makes many outlandish claims about himself, primarily that he is Christ in the flesh, calling himself, The Man Christ Jesus , also admitting to be Antichrist. Jose Luis De Jesus Miranda claims that he is God. "TODAY, GOD HIMSELF, THE ONE AND ONLY GREAT GOD, THE ONE THAT KNOWS WHAT IS TO COME SINCE THE BEGINNING OF TIME - THE MAN CHRIST JESUS - ANNOUNCES THAT WE HAVE ENTERED THE COUNTDOWN TO THE DAY OF THE TRANSFORMATION." "The Man Christ Jesus is Antichrist because he teaches the church to leave behind the teachings of Jesus of Nazareth, thus continuing the mission of the Apostle Paul (Hebrews 6:1 and Revelation 13:12)." Jose Luis De Jesus Miranda sports a tatoo of the number "666" and encourages his followers to do the same. Jose Luis De Jesus Miranda also makes the claim that sin no longer exists and the devil has already been destroyed. Jose Luis De Jesus Miranda is a false prophet and a false Christ.